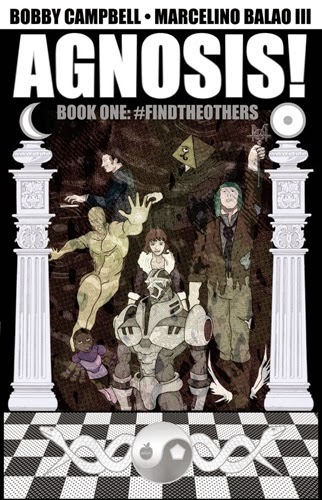 Bobby Campbell has issued the new digital comic book AGNOSIS #1 — #FINDTHEOTHERS. It is 64 pages long and available for $1.95 as a digital download here. I bought my copy right after it came out and read it the next night. It's written by Bobby with rather good art from Marcelino Balao III. RAW fans will enjoy the work, as it is dense with allusions to Bob, Timothy Leary, James Joyce, Robert Shea, Aleister Crowley, etc., and will enjoy seeing some of their concepts brought to life in Balao's art. I particularly liked the No Bunny and the entire panel illustration the eight circuit model of consciousness. I hope Bobby sends this to Alan Moore and gets a response. There's no DRM, so I was able to download my copy, back it up online, and then transfer it to a tablet for convenient lie-on-the-couch viewing. Also available: Weird Comix #1, an anthology from Bobby (for just 99 cents). I interviewed Bobby earlier this year. Thanks so much for the write up! And thanks to everyone willing to give this thing a gander! I actually wrote the script for this, and Marcelino drew all the art, back in 2004-05. I was writing it while I was studying w/ RAW at MLA. Back then he would occasionally hold small group discussions in internet chat rooms, and one night, because I was 23 and stoned, and he was 72 and drunk, I asked and he agreed that I could use Simon Moon (My fav RAW character) in the comic I was working on. After the fact I felt like it wasn't really fair that I asked him that, and that maybe I had taken advantage of his kindness, and so I decided not to explicitly use his character, but rather just a sort of an oblique homage. Which actually works better for such a meta-fictional/medium aware/multiversal character. And so maybe Simon Moon appears in Agnosis! and maybe not. "I never died, said he; I never die, said he"
@Thorfinn Axelson I know that I love Canada, and friendly/creative/cooperative solutions to social problems, and Swiss Chalet!